Today I’m going to talk about a health topic, one that relates to your body called intermittent fasting. Now, there’s a lot of information about intermittent fasting on the internet and my background in the wellness field goes over 20 years. So, something that I practice is intermittent fasting, in my daily life. So, intermittent fasting is simply fasting intermittently. And the way that most people do it is they stop eating at a certain time and then don’t eat until another one. For example, usual intermittent fasting times or fasting phases, are 12 to 16 hours. Yet, there’s no hard data on the exact time you need to fast for. So, for example, what I personally do is I stop eating by 7 p.m. and then I don’t actually have another meal until 10 a.m. the next day. Now, there’s some controversy with that and some people add bulletproof coffee or just coffee to their diet, while others say anything but water doesn’t count as fasting. Now, the debate’s out there but I can tell you from my own practice, adding coffee and eventually a bulletproof style coffee, really works for me. It keeps my energy, really helps me feel good and allows my body to digest the food from the previous day. Now, I still eat a very healthy meal, a healthy lifestyle. So, adding the basics of lots of vegetables, a protein to each meal, really keeping that going. Now, common questions I get from intermittent fasting or about intermittent fasting is one, how do I start? Well, that’s simple right? Now, you can just simply start by setting a time when you’re going to have your last meal and then looking ahead 12 to 16 hours of when your next meal will start. At first, this is going to be really weird, right? It’s really weird for most reasons. One, is we habitually eat breakfast right when we wake up, maybe for you, it’s coffee and a croissant, or maybe for you, it’s cereal in the morning with your family, I don’t know. But, for most people, it takes about a week to get out of that weird feeling of missing out. You have a few hunger pangs you know, going oh geez I’m hungry. And that’s where bulletproof coffee or something like that can really come in handy. But, for most people, it’s really just the habit of eating in the morning that comes in. And after about a week, you don’t even notice that you’re not eating. Yeah, you know when you go into with other people in social situations and for myself with my family, and we travel a lot, and we’re always hanging out with great people, so when we go out to breakfast with them, me just having a coffee can seem weird. And sometimes I skip in and out of it. It really depends on what I want to do. Remember, I’m the author of my own story. But, 90 plus percent of the time I am practicing intermittent fasting. And one thing that really helped me out was getting the intermittent fasting journal by Brian Grynn. Now, I love this journal, and frankly, to be transparent, Brian is a client of mine, a coaching client so I work with him. But, his journal helped me for the first 21 days pushing past the barrier of the fluctuation. And since then, what I’ve noticed from intermittent fasting is an increased amount of energy, fat loss and also more focus in the morning. And it really surprised me, it surprised me at how culturally conditioned I was to eat at specific times. And coming with the wellness background, I was always told to gain muscle, you know the science says that you need to have branch chain amino acids in your bloodstream every two hours, right? And so, that meant that you needed to eat. So now what I do in order to maintain muscle mass, is I supplement with branch chain amino acids, or BCAAs in the morning when I don’t eat. Now, this isn’t going to have an insulin spike and it’s against traditional fasting protocols, right. But, I also do this in the evening. Now, this helps me maintain muscle mass, reducing body fat, increasing energy. Now some of the things that I’ve been taught about intermittent fasting, is it also helps switch from glucose energy, so this is when your body is actually using your sugar stores, right to burn calories to fat burning mode. It usually takes about 12 hours for all this to kick in. And that’s where intermittent fasting really comes in handy. Now, if you’re eating more of a ketogenic type diet, and you’re really focusing on fat burning, this is a great way to kick-start that. Also, what I’ve also been told is that cells, especially cancer cells, it actually stops them or prevents them from growing quickly because they are not able to get the glucose they need or sugar in their body to actually form and thrive. Now, this is just what I’ve been told, I’m not a doctor so don’t take that as gospel from me but, just what I’ve heard and read quite a bit about from people that I personally respect. So today’s tip, what I’d like you to try, if you’re interested, is intermittent fasting. And you can try this in a different way. Skip one meal for one week and see how you feel. The thing that I thought was the most eye-opening for me is how culturally conditioned I personally was and somebody who thinks they are very aware of themselves to when I was supposed to eat. I’ve been conditioned so much that it took me about a week to get off it and I actually realized I felt a lot better. That’s it from me today, I’d love to hear your experience with intermittent fasting. 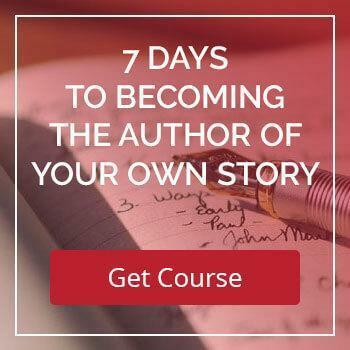 Please go over to our Facebook group, it’s private author of your own story, and then we can also make sure that you sign up for our newsletters so you can get the latest tips, tricks and techniques delivered right to your inbox. That’s it for me today, have an amazing day, and remember, go out and be the author of your own story.